In the bus stop outside Birmingham’s NEC, I met a woman and her daughter who had just paid their annual visit to Crufts Show. Curious to hear their verdict on the day, I gingerly confessed to being a first-timer and suddenly both were keen to fill me in on their past experiences of attending the world famous event. Their animation in describing the show events and the suitably primped and preened dogs they had seen, as well as the enthusiastic faces that passed me by in the exhibition halls and Arena, spoke volumes of the day and indeed the four-day event. After everything I had previously read and researched about Crufts Show, it seemed at odds with the accusations of inbreeding and lapse welfare standards that had eclipsed the show since 2008. PETA’S view of Crufts as a ‘grotesque charade’ was contrary to people’s glaring pleasure and enjoyment. In hindsight, I wondered if both mother and daughter had recognised the very stress they had wanted to avoid in their own dogs, in some of the 21,500 dogs that were exhibited this year. Just as I had done, it was easy to overlook the discomfort of the canine competitors when engrossed in the crowd-pleasing spectacle. In fact, by the time I came to leave, the soundtrack of loud barking, whimpering and growling that had uncomfortably filled my ears all afternoon had become subtle background noise. Even the ‘too-perfect’ dogs that had captivated me at the beginning were being more harshly scrutinized by my suddenly conditioned eyes. Perhaps I am being a little dramatic; my first impressions of the event were not entirely sceptical and I thoroughly enjoyed the display of human/animal solidarity that was apparent wherever you looked. While many animal welfare charities will disagree, I saw no shortfall of love for the dogs that were being shown. On the contrary, owners seemed suitably besotted with their animals, many of which were adorned with colourful ‘Good Luck’ rosettes and whose holding bays were festively bedecked with cards from family members and well-wishers. It had the air of school sports day about it, with parents proudly supporting their own. The very first dogs to grace me with their presence were the Afghan Hounds – glamorous and regal, with long, luxuriant coats, narrow noses and curled tails. It took me a while to accept these animals weren’t statues, as their motionless forms stood indifferent to the loud noises and clamorous goings-on that surrounded them. After the Afghan Hounds came Irish Wolfhounds. These really were a sight to be reckoned with. Impressive in size and stature, with long legs, a rustic-looking grey coat and a distinctive trotting gait, the Wolfhound really captured my interest and drew me towards the Best of Breed class. Impossible to differentiate one from another, the Wolfhounds paraded round and round the show ring and stood patiently while the judges inspected and measured their every inch. I was amazed by the dogs’ good behaviour and even temperament considering the circumstances. 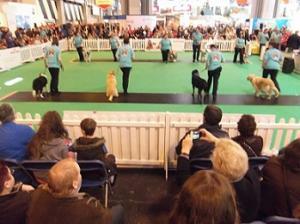 But the dogs certainly seemed to be enjoying their moment, as they did being led around the exhibition halls. Having had my fill of the big dogs, I decided to watch the Best of Breed class for the compact Australian Terrier. Sat scribbling away with my pen and notepad, I was surprised when someone leaned over my shoulder and asked if I was judging the class. Consisting of a handful of near-identical dogs, the event got underway and the excitable animals trotted their merry way around the show ring, baring their gums when requested and standing to attention like soldiers. It was pleasing to see the devotion between man and man’s best friend as the dogs went on their hind legs to paw at the knees of their owners (perhaps asking “did I do well?”), but the repeated yanking on the thin leads to get the dogs to raise their heads and keep them raised was somewhat irksome from the sidelines. In between classes I wandered around the halls admiring the dogs and speaking to people about their experiences of the day. I saw dogs of all sizes and from all groups, and was even lucky enough to stroke a beautiful Leonberger named Balthazar. There were dogs in waterproof jackets, with hair rollers in their coats, in squat cages with sheets covering them, in pushchairs (or whatever the doggy equivalent) and posed gracefully in their beds like taxidermy. It was reassuring to see that Crufts welcomed a number of campaign groups such as DogLost and Vets Get Scanning, as well as the inevitable trade stands and paraphenalia. This year saw the introduction of five new breeds, including the Catalan Sheepdog, Entlebucher Mountain Dog, Turkish Kangal Dog, Eurasier and Portuguese Pointer, which unfortunately, I was not lucky enough to see. Had I dedicated all my time at Crufts to admiring the breeds, I am convinced I would still be there. The dogs were magnificent – yes, some were too weird and wonderful for my liking, but I could appreciate they demonstrated the very best of their breed. As I was stood watching a Young Kennel Club class, a woman beside me commented that ‘I wouldn’t see better examples of dogs anywhere,’ and I quite agreed. To end the day, I paid a visit to the Arena to witness the ‘Scruffts’ Final. Whilst I was happy to finally see an event that recognised crossbreeds, something about the name bothered me slightly, being a great admirer of crossbreed diversity over pedigree uniformity. The winner of the class, a dog named Wylie that was rescued from Afghanistan, was far from scruffy and fully deserving of the award. It was refreshing to see dogs being rewarded for temperament over appearance, although some of the ‘Scruffts’ competitors could have given those in Crufts a run for their money on that score. As I was leaving, I reflected on the show and the over-riding feelings it had left me with. The day had really opened my eyes, not just to the myriad of dog breeds that competed in Crufts every year from across the world (over 2,650 dogs from 48 overseas countries took part this year), but to the extraordinary lengths dog owners would go to to achieve success. While there will be many people that disagree with me, I couldn’t help but feel the dogs weren’t really enjoying their time at Birmingham’s NEC, crated or made to stand patiently for hours, being preened and fussed over, before competing amongst other dogs they had never encountered before. Add to that all the noise of other unfamiliar dogs and people, and you’ve got a high stress situation. One of the last things I saw as I was passing through the exhibition halls towards the exit was a Standard Poodle, white but not dissimilar from this year’s Best in Show, standing statuesque on a platform heated by spotlights, with its fur dyed colours of the rainbow and the words ‘Crufts 2014’ stained along its side. A gaggle of people had gathered around the public curiousity (or dog, rather), and were moving its head this way and that for the benefit of a camera shot. It was uncomfortable to witness and the only thing that kept my feelings at bay was the dog's apparent indifference, suggesting it had been there before. All that said, the day was charged with excitement, colour and expectation and it was a great experience to be there. While not all the dogs I encountered seemed happy, they all appeared healthy, which is definately worth mentioning. Fortunately, I saw no genetically flawed animals during my time at Crufts and I was relieved at times to see dogs being awarded for their welfare and temperament over their appearance. The Best in Show was aesthetically modified, yes, but Ricky the Poodle was also well conformed, healthy and in excellent condition. A deserved winner. I can't help but wish a not-so-perfect dog (perhaps a neutered crossbreed with a handsome face and an easy nature) would win one year, although I realise this would surely defeat the point! Still, Crufts has come a long way in recent years, and who knows what the future holds for the show. As long as the welfare of dogs remains at its forefront, I see nothing wrong with celebrating the diversity of breeds out there, from all corners of the globe, that we are lucky enough to have as companions. I went last year. The place was very crowded and noisy and many of the dogs looked utterly miserable. The long haired dogs were constantly being primped and preened and not allowed to be dogs at all. I would never take my dogs there. The flyball dogs were enjoying it though, just being dogs ! In one of the halls it was so hot and stuffy that I got a migraine and had to get out in the air . In that hall there were crated dogs left unattended with covers over - only later did I hear that several had died. That really is shocking and I have not been back this year. Painting a dog like an advertising board is just not right, I hope that never becomes popular at Crufts or anywhere else in the UK.